According to Shiva Purana, sincere worship of Lord Shiva yields merits including spiritual growth for the devotees. It also provides extensive details on the right way to perform Shivratri Puja. Besides, worship of Lord Shiva on Shivratri is also considered to be extremely beneficial for women. While, married women pray to Shiva for the well being of their husbands and sons, unmarried women pray for a husband like Shiva, who is considered to be the ideal husband. After this, Bilwa leaves, which have to be a stalk with three leaves, is kept on top of the Shivalinga to cool the hot-tempered deity. Ber or jujube fruit is also offered to Lord Shiva, as it is symbolic of longevity and gratification of desires. Some devotees also offer the auspicious betel leaves to Lord Shiva marking satisfaction with worldly pleasures. 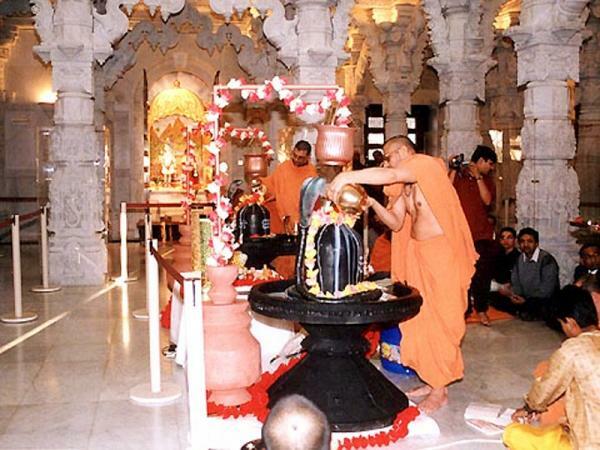 Garlanding of Linga with flowers and garlands is also a part of the ritual Shivaratri Puja. Devotees also burn incense sticks as is said to yield wealth. Many also light lamps to symbolize attainment of knowledge. It is said that by offering water, hugging the Linga, lighting the diya and incense and ringing the temple bells, devotees call into focus all their senses, making them acutely aware of themselves and the universe to which they belong. This ritual worship of Lord Shiva continues through the day and night of Shivaratri. Devotees stay awake and spent the night in Shiva temples by chanting ‘Om Namah Shivaya’ and singing hymns and verses in praise of Lord Shankar. Devotees observing vrat on Shivaratri break it only the next morning by partaking prasad offered to Lord Shiva.